The Center for Hybrid Quantum Networks (Hy-Q) exploits photons to merge disparate quantum system into large scale quantum networks. The long-term perspective of the research is to enable large scale processing of quantum information over global distances. 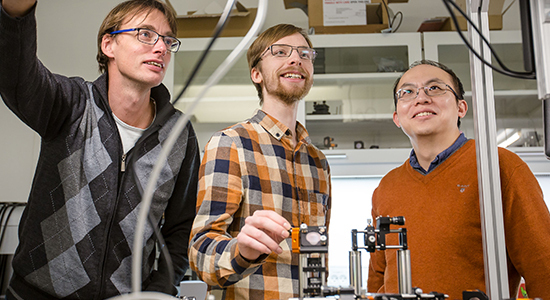 Hy-Q consists of three groups at the Niels Bohr Institute, University of Copenhagen: The Quantum Photonics group, the Theoretical Quantum Optics group and Quantum Phononics Group. See the list of the Hy-Q staff at the Niels Bohr Institute, University of Copenhagen. The Center for Hybrid Quantum Networks (Hy-Q) exploits photons to merge disparate quantum system into large scale quantum networks. The long-term perspective of the research is to enable large scale processing of quantum information over global distances.